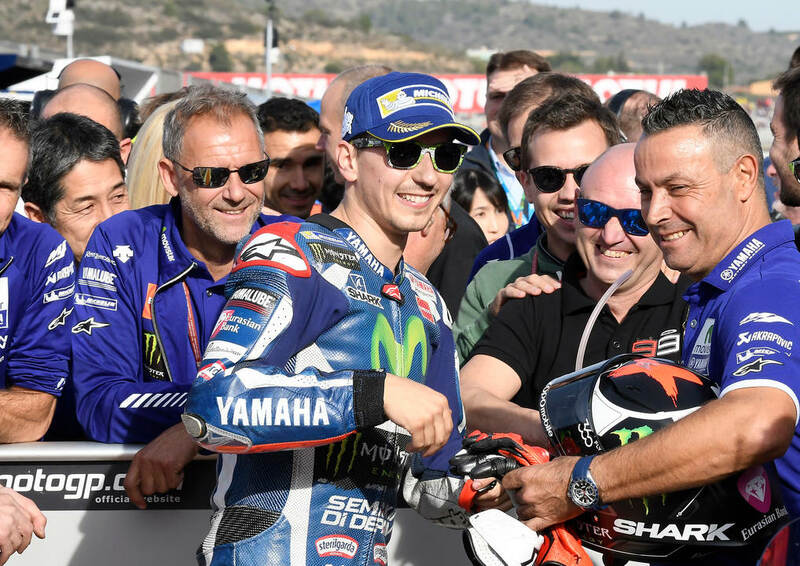 Jorge Lorenzo finished off his career at Yamaha with a dominant win earlier today in Valencia. Lorenzo led from the start, and even had a lead of roughly 5 seconds before winning with a gap of less than 2 seconds over second place Marc Marquez (Honda). Near the end of the race, Marquez finally broke free from a tight battle over second place with Andrea Iannone (Ducati), Valentino Rossi (Yamaha) and Maverick Viñales (Suzuki). Iannone grabbed the final spot on the podium ahead of Rossi. Note that KTM’s Mika Kallio ran near the back of the pack before retiring roughly 2/3 of the way through the race. This ends the 2016 MotoGP season with Marquez crowned as champion. Next week, riders will test at the same Valencia circuit aboard their 2017 machines. For example, Lorenzo will get his first taste of the Ducati. MD will report on these tests. Moto GP is who can put a season together. Need an example think Hayden over Rossi that one year. May yet get some down to the wire racing for championship in the premier class with some serious spoilers in the mix. This year a lot of unforeseen stuff from top riders and great rides from others and in spite of all the different winners and chaos and although MM did not dominate he had the championship in hand well before the last race. Bring on 2017. Rossi will win 2017 championship then retire as a champion. Lorenzo ran a flawless race. When he is out in front with a clear track he is awesome to watch. So fast and smooth. Might be his last win for awhile. I thought Marquez was pushing it for the sheer joy of it and that could have been disatrous. With title in hand he could have managed second place and ridden home safely instead of risking a career ending injury with nothing to gain chasing down Lorenzo. Shows where the kids heart is. The race for third especially between Iannone and Rossi was fantastic. Again Rossi was in a position to just get a safe second in the championship, yet he challenged. Same heart as Marquez. They just want to win, no matter the cost. Vinales is looking up to his potential. Will be interesting to see him on the Yam next season. Can’t wait for next year. My 44 th year of following GP racing. Was hard to see Dani on the ground again. Hope he comes back strong and healthy next season. Maybe I missed it, but I can’t remember seeing the KTM during the race. Too bad they did not make it to the finish. I was hoping they would have a better result. The race for second place was pretty exciting, Lorenzo rode a fantastic race, everything seemed to be be clicking for him. Surprised MM got as close as he did in the last few laps. It was a great season of racing in my opinion, I really enjoyed it, and looking forward to next season. No predictions here, but it will be very interesting to see the changes, rider’s and machines. 10 th lap you saw the KTM in the pits with kalio talking to me hanics and I assume engineers. Jay on the Duke, Joe on the Zook, and Mav on the Yam. Won’t be the least bit surprised to see those three finish next season in the opposite order of how you have them listed there. I also won’t be surprised if Dovi finishes ahead of Jorge. Not sure which is the ballsier prediction there, Lorenzo winning the title in his maiden season on the Ducati, or Miller finishing ahead of Pedrosa, Crutchlow, the Espargaros, et al. Considering his penchant for DNFs, I’d barely offer even odds that Miller finishes ahead of Norm G, Provalogna, or mickey. Lorenzo, he cannot ride in the rain I can’t see him winning..
Lol mickey couldn’t catch Baz on Baz’s worst day…or VLJ for that matter. Old and slow mickey is. I’ll second Jeremy’s prediction. That looks pretty fair to me. That’s just it Jorge, needs everything perfect, one or two obstacles and he always fails. Heaven forbid it rained. Too bad Rossi went with the softer front option. I would have liked to see him finish 2 or 3. Iannoni should have worn a different shirt on the podium. ” Ducati, you picked the wrong guy!” He raced extremely well given his condition. What a way to finish the season with not one but three over the top races. Jorge’s win was flawless and expected but the fight for the other two podium spots was fantastic. OK that was good but if you haven’t really followed Moto2 this year and didn’t see today’s you owe it to yourself to see a replay. The first 10 or 12 laps were some of the best racing ever and the last few laps were nearly as good. Same goes for the Moto3 race. Brad Binder is a future Top class Alien. Watch it and marvel. The top three riders finished in less than a tenth of a second.